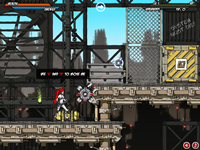 Sci-fi “run & gun” platformer game. This is a story about enhanced soldiers confrontation. Take control over enhanced soldier and lead her through 21 game level, wiping out all enemies on your way.